I’m on the GoFlow mailing list and received this update this morning. We’ve been silent for a few weeks now, and it’s time to bring you all up to speed on the GoFlow project again. (The diy tDCS kit if you’ve forgotten) We have officially been rejected from Kickstarter, and are delaying the production of our devices for a short while. However we do have some progress to share with you all, and enough info to get anyone who is interested a decent way along in building your own. See below. While it’s too bad that we are not able to rock a Kickstarter campaign, we move forward. During the process of getting the project ready for crowd funding we ran into a few legality concerns that probably would have stopped us from launching as quickly as we had planned, even if we were approved for Kickstarter. We are taking the time to investigate these concerns now before we do something to prematurely sink our metaphorical ship. If any of you have any experience or thoughts that you’d like to share, we would love to hear from you. We’d love to hear from any of you that have experience with working with, and or around, the FDA. We’re talking to a few specialists and mentors now, but we are interested in leveraging the collective knowledge of you all as well. We will keep you all updated to our progress as we move forward. Our current circuit design. Feel free to download it! 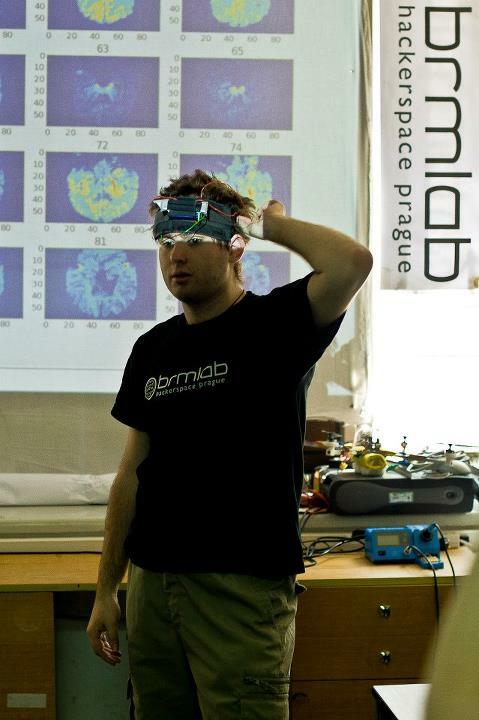 Petr dropped me a line with an update on what brmlab has been up to lately. Wow! Check out the photo album. Very interesting collection of crew and gadgets. Here he is with an early version of his tDCS device. Due to F.D.A. requirements the focus v1 is not currently available for sale in the United States. If you live in the U.S. and would like to buy a focus device, please pre-register. If there is sufficient demand from U.S. customers we will seek the necessary certification. I think we can expect a lot of that. But how cool! You can sign up for ‘priority access’ on their site. One of the things Petr and I discussed is objective testing for use in determining whether or not a tDCS device is actually doing anything. Petr came up with some great links. Both PEBL Psychological Test Battery and Brain Workshop – a Dual N-Back game, seem to be tests you download to your own computer. But I’ve just spent the last 20 minutes doing tests on a site called Quantified Mind. Except for the Google (only) login, it’s about perfect. A nice collection of tests and the results are collected very nicely into a statistics page that associates with your account. Cool! [Update 5/25/12] Another interesting candidate for measuring effectiveness. Lumosity research partners include Stanford and Harvard. A very basic reaction time test, HumanBenchMark.com. Petr also mentioned that he corresponded with the GoFlow people and they are going to set up a wiki. In their recent email they announced they were a little bit behind and were waiting to hear back from Kickstarter. But that whether or not they get Kickstarter approval they’ll be moving forward soon.